Join the UMHCA Mu Eta Chi Honor Society and celebrate all of your hard work with your fellow counseling students. Congratulations on your dedication! We honor you for the past few years of focus and determination. 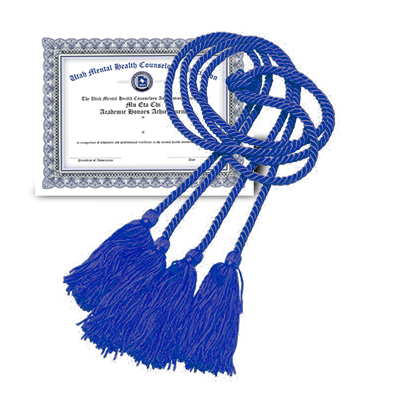 Have your name added to our Website as a graduating Honor Student. Receive your UMHCA Honor Society certificate for framing. 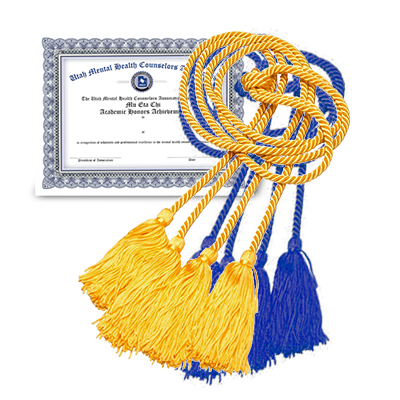 Receive a Gold and/or Blue Honor Society cord to proudly wear during your graduation ceremony. Receive discounts from UMHCA for conference attendance. Receive discounts from UMHCA partners for training, insurance, & becoming certified in specialized fields. You must apply 60 days before graduation. Student must be an UMHCA member for one year before graduation. Email Honors@umcha.org for exceptions for the one-year rule. Student must have completed minimum 45 hours in academic program. Upload your unofficial transcripts to receive your cords for the GPA achievement (see application form below). Your cords will be mailed to you in advance of graduation. Your official certificate will be mailed after your graduation and after you submit your final and official transcript. Please send the transcript electronically to honors@umhca.org. (Allow up to 60 days to receive certificate by mail).